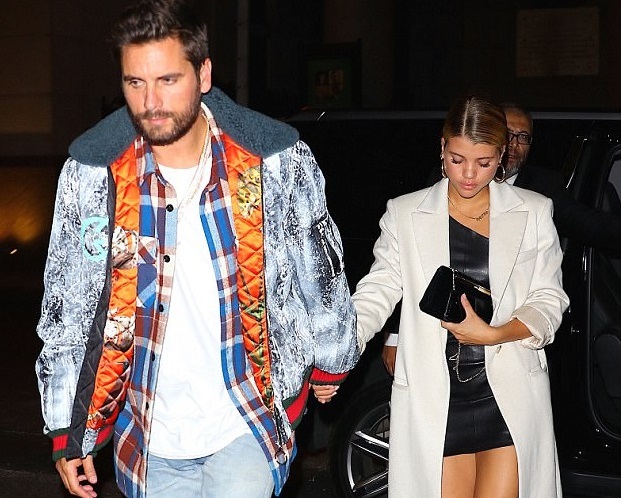 Scott Disick, 34 and girlfriend Sofia Richie, 19, have been going strong ever since they went public with their romance. The inseparable pair were spotted in New York, as they went clubbing at the Up and Down and 1OAK on Thursday night after jetting back from a romantic mini-break in Venice, Italy. For the outing, Sofia donned an asymmetrical LBD, floor-sweeping cream coat and Gucci sandals while her much older boyfriend wore a jacket and plaid shirt which he paired with a pair of blue jeans and white Nike sneakers. Later Sofia was seen heading out of the club in Scott's jacket.